I want to start this post off by saying that I have been watching the news for hours the last days and am horrified by the oil spill in the Gulf. I have spent many a summer in Galveston Island, South Padre Island, and in many of the beaches on the Gulf Coast all of the way to and including Florida. This is a tragedy not only for the wildlife and beautiful beaches, but for all of the hardworking Americans that fish and own/work at hotels and tourist attractions on the Gulf Coast that will be affected. You are all in my prayers. Today, to cheer me up, I invited the Army Guys back. So while I was sweeping the back porch the other day (the boys were playing on their swingset) I came open this scene. I was shocked! 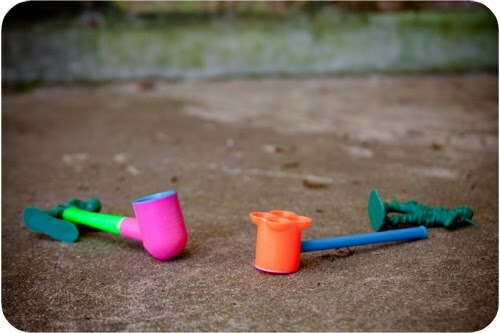 What were these two Army Guys doing with my children's bubble pipes? I decided to walk away since the Army Guys are of age and are usually very responsible. But I will have a talk with these guys later and mention that this is something they need to do after my boys have gone to bed. Ha!! That was so funny..I needed a good laugh! That was hilarious, I showed it to my husband who is usually unmoved by my interest in photography, and he died laughing! I really needed a good laugh, thanks! I love the army guy posts! Hahaha! 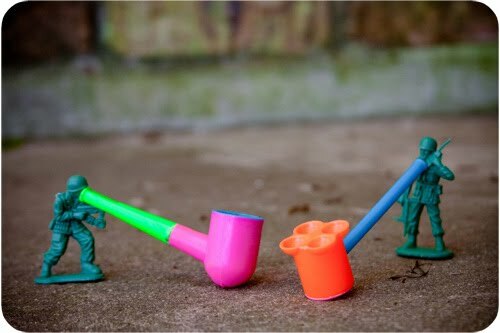 I am loving your army men posts, great stuff! Love the army men post but this one is too funny! I love, love the army guys. My husband even cracks up while reading it!